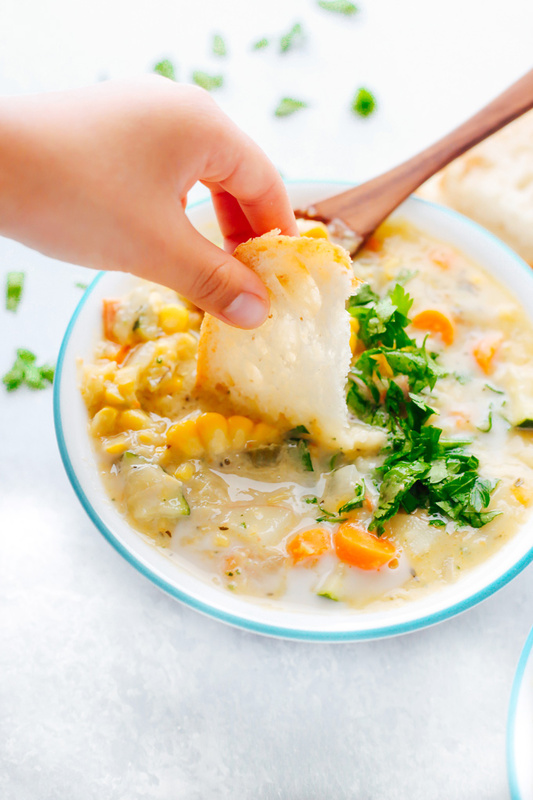 If you’re into soups, especially chowders, then this recipe is for you. Keep reading! 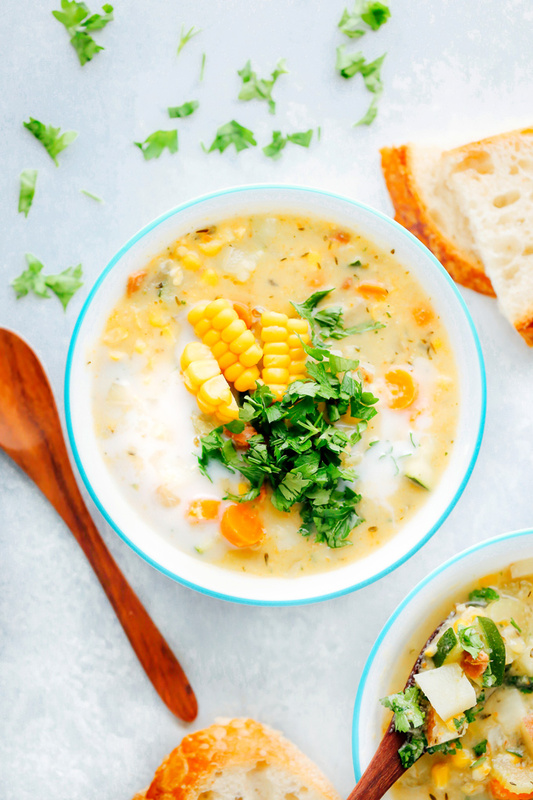 This Vegan Corn and Zucchini Chowder is where it’s at when it comes to summer soups. The entire thing is just a boat load of veggies and herbs made deliciously to satisfy your tastebuds and your insides. Chowders are usually super thick and heavy but then on the flip side they can be light and airy, like this one. There is no flour in it to create thickness as the veggies do that all on their own. No half and half or creamers but only a small amount of unsweetened almond milk to give it that creaminess we all expect. Also side note the bread is an organic gluten free sourdough loaf fresh from WholeFoods. 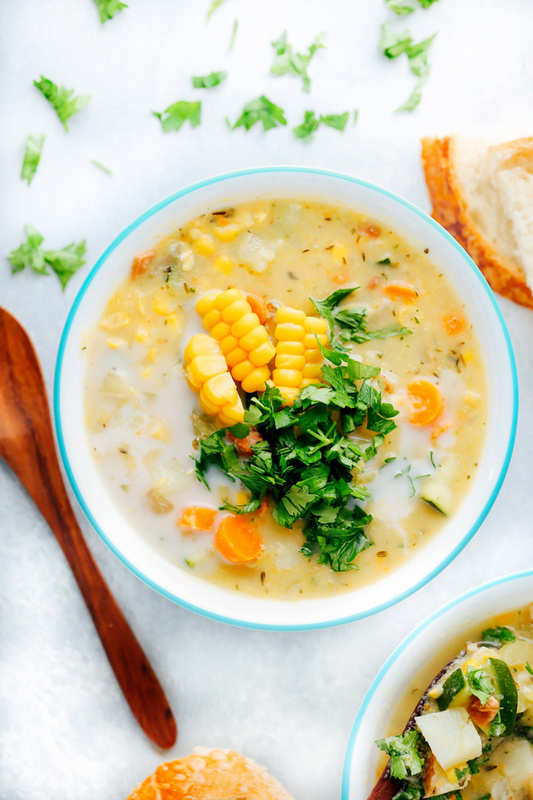 Pairs ridiculously well with this soup, obvi. This is a really good way to get your veggie intake in. Their not over cooked, robbing them of their nutrients. The potatoes are just soft enough like they would be for a stew. Each one compliments the other. Oh and instead of using parsley to garnish (heavily) I used cilantro to give it a little zing and it works Ah-maze. Plus the health benefits of cilantro are off the hook so I add in a ton. You can totally do parsley too because that’s all sorts of health amazing as well, but for this I thought cilantro was a match made in chowder heaven. My love for cilantro is real and I find a way to add to a lot of things, like my Potato Wedges or Vegan BBQ Pizzas. I adapted this recipe from LittleBroken and her tip with chowders or soups in general (that I’ve been using since I read about it on her blog) is you take 2 cups of the soup or half of the soup and blend or process it. 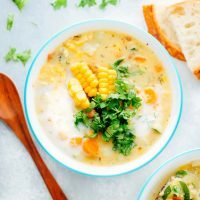 It makes the soup thicker and creamier without having to add in flour or cornstarch. Which I thought was genius. 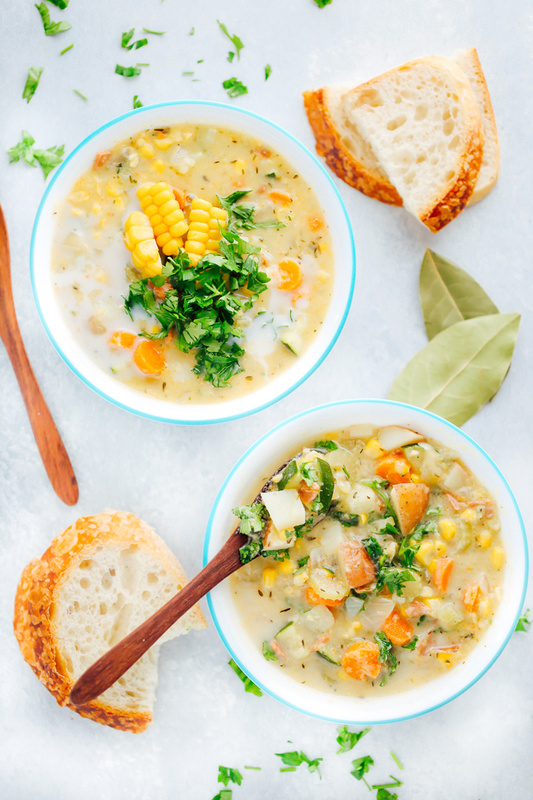 Let me add one more thing before you venture off into Vegan Corn and Zucchini Chowder land. 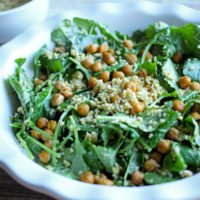 You really don’t need to sprinkle on some vegan parmesan because it’s totally good all on it’s own. BUT, I mean, if you wanted to, to just take that extra step, you can totes sprinkle on some vegan parmesan and it will be heavenly. I have an aunt who loves parmesan so much growing up we use to say she put it in her morning coffee. To each their own, ya know what I mean. Ok I have some soup to devour and I believe you’re about to too. Enjoy yo’ summer chowdaa. 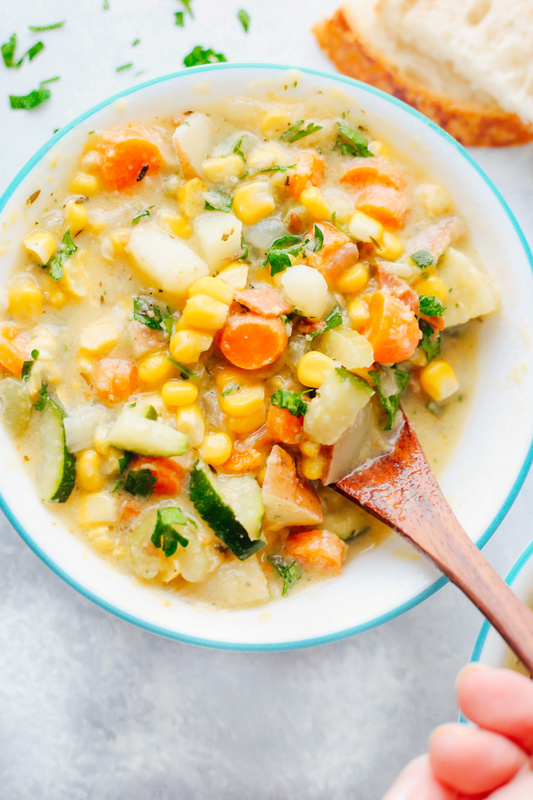 Creamy vegan chowder loaded with corn, zucchini and other herbs and veggies. Light, airy and perfect for summer. In a large pot melt butter, oil, and garlic until garlic is slightly browned. Add in the chopped vegan bacon and the holy trio: onions, celery and carrots and let that cook until translucent. Sprinkle with some salt/pepper and add the 1 tsp of thyme. Toss around well so all veggies are coated. When the veggies are translucent pour in water, add potatoes and bay leaves. Bring to a boil then lower to a simmer and let cook simmering for 10 minutes or until potatoes are tender. Add in the corn and zucchini, season some more with salt/pepper and adjust to your liking. Let that cook another 10 minutes just until the corn and zucchini are cooked. Remove the bay leaves and take half of the soup, pour it into a blender or processor and run until creamy. Pour back into pot and add in the almond milk and leave it for 5 minutes. You don't want it to boil. Garnish heavily with cilantro and serve immediately. You can store any leftovers in an air tight container in the fridge for up to 4 days. Enjoy with some organic gluten free sour dough bread! 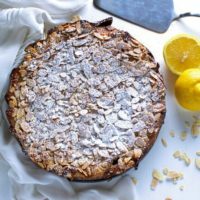 Can sub almond milk for organic soy milk for a creamier texture. Made this today. No oil, butter, or bacon. Just used vegetable broth. Also used some shredded zucchini, not chopped, because that’s what I had in the freezer. Very good flavor. There’s a note at the bottom about subbing almond milk for soy but I don’t see either of those called for in the recipe?? Hi Megan, the recipe calls for 1.5 cups almond milk. It’s listed in the ingredients list. So instead of using almond milk you can use soy milk. 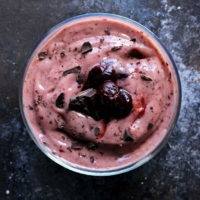 I *swear* I read this recipe four times (albeit in the grocery store, on my iPhone) and never saw the almond milk in the ingredients or instructions. Thanks for replying though! I’m making this for dinner tonight. Hey Megan, I haven’t gone in and updated the recipe. The last time it was updated was the day it was posted, the almond milk has been there the whole time I promise! Enjoy the chowder and keep me posted. Also what did you end up getting, almond or soy?